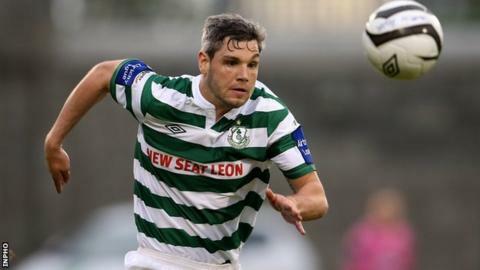 Derry City have completed the signing of former Shamrock Rovers defender David Elebert on a one-year contract. The 27-year-old centre-back has also previously played for Hamilton Academical, Scarborough and Preston North End. "David will undergo a strict pre-season regime on his own as he is behind the rest of the squad in that respect," said Derry City manager Roddy Collins. "He has experience and can also play at right-back or left-back," he added. "If he makes it for the start of the season in March all the better, but if not April will be fine." Last week Collins secured the signature of defender Aaron Barry, who impressed on trial and scored a goal in a friendly game against Institute. Barry, who started his career at Wicklow side Arklow Town before securing a move to Sheffield United, has agreed a one-year deal. The Candystripes face Glentoran in a friendly on Tuesday night and will begin their Premier Division campaign with an away match against Shamrock Rovers on Friday 7 March.